When: Fri. Apr. 5th 1:00 p.m. - 2:30 p.m.
Health is not just about what you eat. It is about what you are thinking and feeling too. Join us in our effort to change the stigma surrounding mental health. Learn about the various barriers that one might face when battling with mental health issues, along with finding healthy ways to cope with it. Remember: self-care is not selfish. When: Fri. Apr. 5th 7:00 p.m. - 10:00 p.m.
A semi-formal event. Experience Alpha Psi Lambda's presentation of Delta Lina. Ritmo Latino will perform, and a dance social will be hosted afterwards. When: Sat. Apr. 6th 1:00 p.m. - 5:00 p.m. When: Tues. Apr. 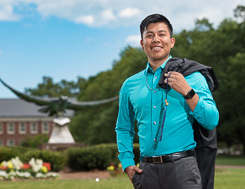 9th 5:00 p.m. - 7:00 p.m.
Join Centro in congratulating UNCW admitted Latino/Hispanic students. We need volunteers to welcome and answer any pending questions that our prospective students have in mind. Let us show some TEAL love to our future Seahawks! Dinner will be provided. When: Tues. Apr. 9th 8:00 a.m. - Wed. Apr. 10th 8:00 a.m. When: Weds. Apr. 10th 11:00 a.m. - 2:45 p.m. Accompany us as we give a tour around campus, provide critical information to students both via one-on-one and through a student panel. Let's show them what it takes to become a Seahawk! When: Sat. Apr. 13th 9:00 a.m. - 5:00 p.m.
Come compete in a Soccer Tournament at NC State with Juntos Students from other counties in NC. Or just join our team of amazing volunteers! When you sign up as a soccer player, you will receive a t-shirt and meals are included during our day of fun. When: Tues. Apr. 16th 12:30 p.m. - 2:00 p.m. Assist us with providing an engaging campus tour to high school students. Get to establish a connection with students who are wanting to go to college by getting to know them throughout the tour. Help them by answering their questions about a variety of topics. When: Weds. April 17th 9 a.m.-11:30 p.m.
Volunteer for another school tour with us! Join us as we show students from Bladen County around our campus and answer any of their inquires they mgiht have. When: Mon. April 22th 1:30 p.m. - 3:30 p.m.
Give a tour to ESL local students. Show them what opportunities UNCW provides for students, and inspire them to continue returning campus. When: Thurs. April 25th 9:00 a.m. - 1 p.m.
Give a campus tour to ESL middle school students. Show them the variety of activities to engage on campus, and answer any questions they may have. When: Tues. April 30th 9 a.m.- 1:45 p.m.
Give a campus tour to ESL elementary school students. Speak to them about the importance of college and the many activities that campus has to offer. When: Thurs. May. 9th 8:00 p.m.